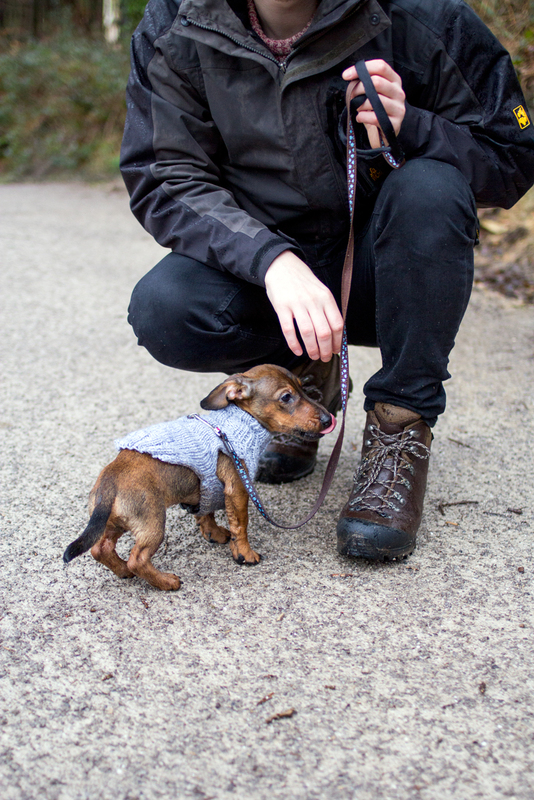 This weekend saw our first proper walk in the country with little Doug and we were so looking forward to taking him somewhere other than round the roads or in the park near our house. 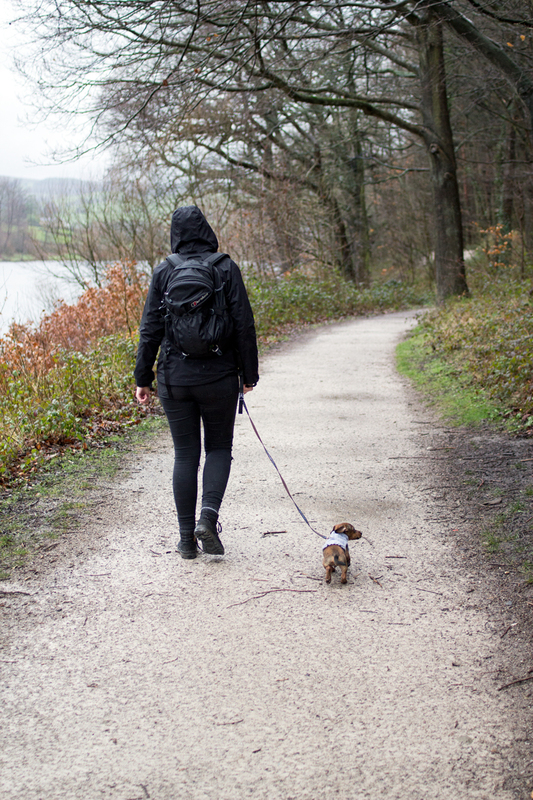 We'd got grand plans for a beautiful sunny explore with the pup in tow, but as is the case with English weather, the day was somewhat damper than we'd hoped. 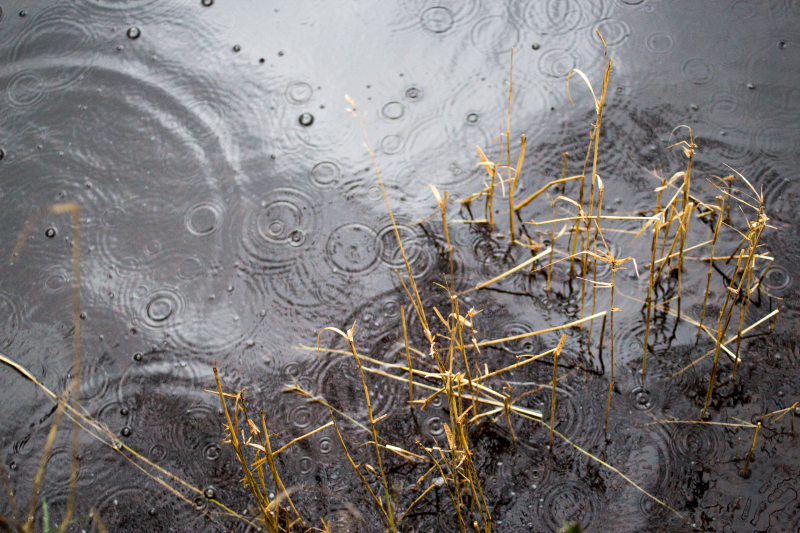 Not to be deterred, we geared up in our waterproofs and headed to our local reservoir for a wet and windy walk. 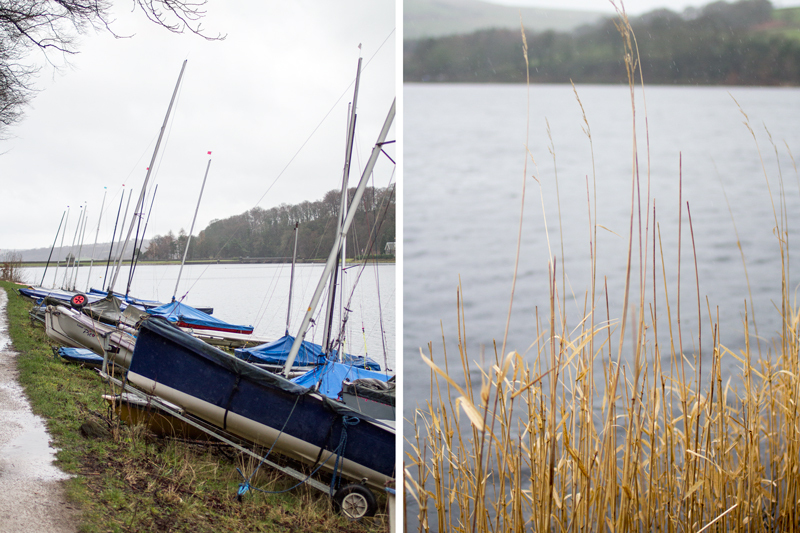 So often I forget how lovely it actually can be to walk in the rain, especially to see the difference in the colour of the water, which turns a mixture of deep greys and blues. The wind whipped the the cold rain against our skin and stuck the hairs that strayed from my hood to my now particularly pink cheeks. 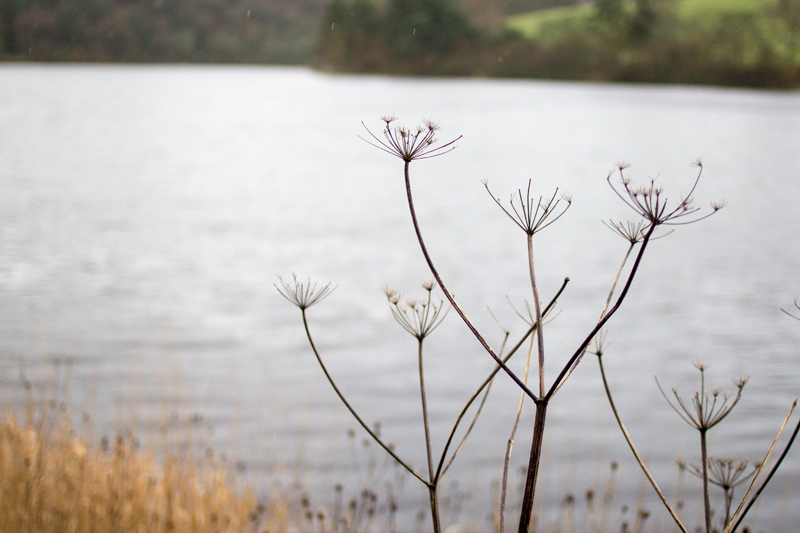 Whilst the weather wasn't ideal, the surroundings were still just as beautiful, if a little bleaker than usual. We passed yet another remarkably tame robin, who wasn't bothered in the slightest by our little pup. 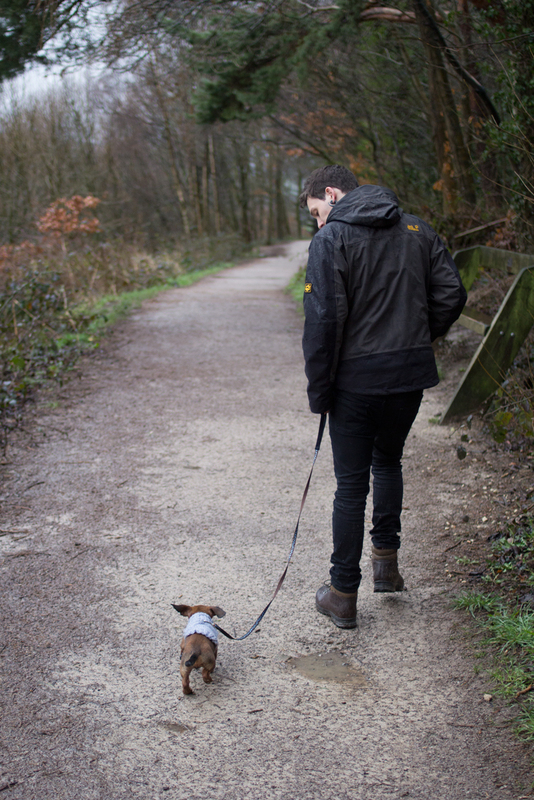 Doug, bless him, wasn't overly sure of the rain/wind/great outdoors combo. He gave the whole experience his best effort though and slowly got the courage to trot happily alongside us. The rain which suddenly got spectacularly heavy, cut things short and a certain pooch had had enough. 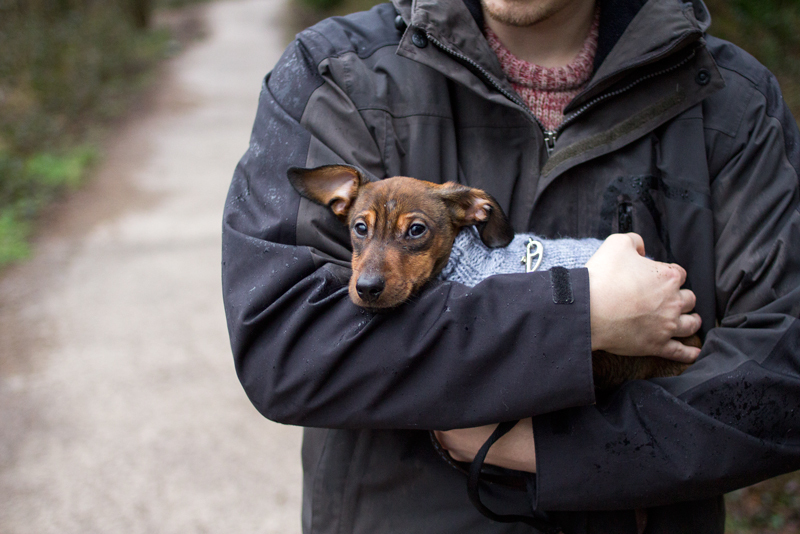 He was carried most of the way back to the car, shivering despite his woolly jumper. This walk made me so excited for exploring more with Doug and somehow visiting a place I've been to countless times, only this time with him, made it feel new again. Bless his heart - Doug doesn't look 100% chuffed about the situation! It's one of my favourite things about having dogs, that you HAVE to get out and about no matter what the weather is doing. You get to see the world a bit differently. He intermittently loved it and hated it I think! I love the little cardigan on the dog - so cute!